And, if you turn on RSS Feed Synchronization in Outlook, any feeds you subscribe to and their posts are delivered straight to your Outlook RSS Subscription folder. If you don't see this button, look for a link named RSS feed or something similar. To add the feed to your browser, click Subscribe to this feed on the page that appears in your browser after you clicked the RSS Feed button. Under RSS Feeds, make sure the Synchronize RSS Feeds to the Common Feed List (CFL) in Windows check box is selected. Click OK, and then restart Outlook. Now, your existing feeds and any new feeds will go straight to Outlook. In your web browser, copy the web address of the feed page from the address bar. 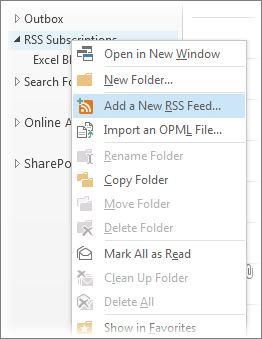 In Outlook, in the Mail Navigation Pane, right-click RSS Feeds (Outlook 2013) or RSS Subscriptions (Outlook 2016), and then click Add a New RSS Feed. In the dialog box that appears, paste the address you copied earlier into the box, click Add, and click Yes.